In this video and article we’re going to explore just how no-dig gardening can save you time and effort – and all while boosting the health and vitality of your soil. A common variation is to use materials that are readily available to nourish and build soil. Popularised by organic gardener Paul Gautschi in his ‘Back to Eden’ method, materials such as woodchips are used to mimic Mother Nature’s infinite ability to recycle nutrients. Let’s make a bed using this method. Start by laying a thick layer of paper or cardboard over cleared ground. Add around four inches (10cm) of compost, then add a layer of woodchips about two inches (5cm) deep, taking care not to mix the two layers. Then simply push aside the woodchips to plant into the compost beneath. You could of course use other materials such as leafmold or hay in place of woodchips. The secret of this top layer is to slow down evaporation and constantly feed the soil below, so that no additional fertilisers are ever required. The secret behind any no-till garden lies in regular mulching with organic matter. Mulches cover the soil’s surface, protecting it from erosion, locking in soil moisture and suppressing weeds. As they rot down they add fertility to the soil while at the same time improving its structure, without the need to dig. In no-dig gardening, mulching replaces digging. Replace old mulch as it rots down or becomes incorporated into the soil, so that the ground is being constantly fed and gradually built up. Add mulches around mature plants or wait until the end of the growing season. Suitable mulches include compost, leafmould, hay, woodchips, grass clippings, straw and sawdust. Mulches also need to be weed seed-free, so they’re not self-defeating. No-dig gardening suits gardens of every size, including small, city plots. Aim for beds no wider than four feet (1.2m) and you’ll never need to step on the soil inside. 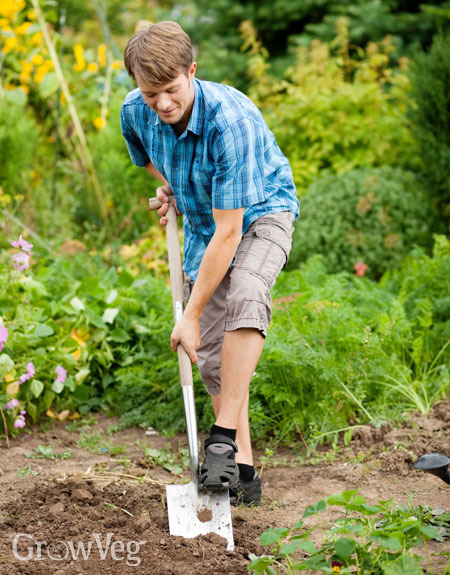 This helps to prevent the soil from becoming compacted, which lessens still further the need to reach for the spade. Using raised beds is not essential, but the sides do help to contain all that additional organic matter. Over time the weeds in a no-till garden become few and far between as mulches work to weaken weeds by smothering them. And because you’re not digging, weed seeds in the soil below need never come to the surface to germinate. No-dig really does save you time! It’s a wonder any of us still dig! No-dig gardening is kinder to our backs, the crops we grow, and the precious soil we grow in. If you’re already a no-dig convert we’d love to hear from you. What method do you use, and what sort of difference has it made to your gardening? Let us know in the comments section below.